Photo: Kawawa Leah is an Ogiek elder and one of the voices of her community. 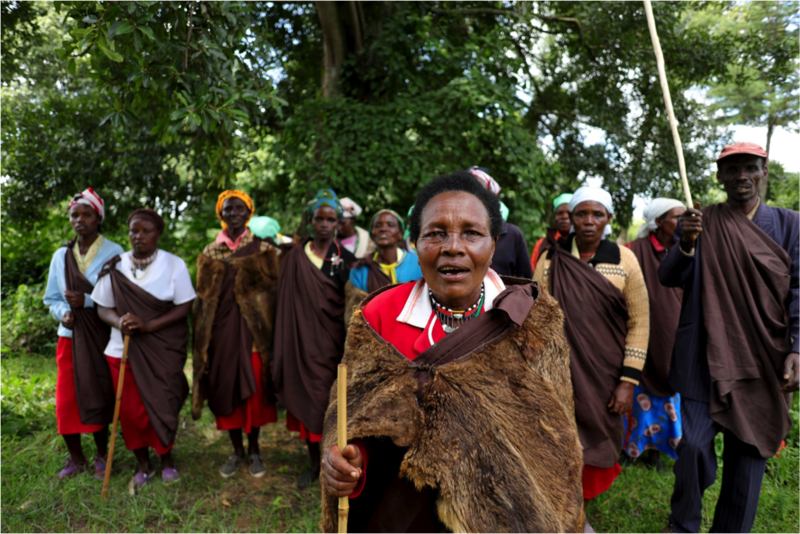 Women were instrumental in the struggle to be given their Indigenous title and their right to return to their land in Kenya. Read more in this report. Credit: Ogiek Peoples’ Development Program and International Land Coalition. On 15 October 2018, the Land Rights Now campaign launched a powerful new mobilization focused on how safeguarding Indigenous and community land rights is critical to building a healthy and sustainable food system. It is backed by over 800 organizations and communities. Across the world, people are taking action, demanding change and sharing their stories of how land rights are connected to the food we eat every day. For many of the world’s poorest people, access to land represents the difference between extreme hunger and survival. Yet many have few, if any, legal rights to the land on which they grow food – even where their ancestors have lived there for millennia. Safe and secure land rights are critical to the wellbeing and health of all those who live on Indigenous and community lands – and to protect them from forced evictions by powerful interest groups. Indigenous Peoples and others who live on community lands are leading the way by showing how we can grow food through working with nature, not against it. At least 50 percent of our planet’s land surface is managed by Indigenous Peoples and local communities, and they are preserving 80 percent of the world’s biodiversity.Unfortunately, just 10% of the world’s land surface is recognize as owned by them. Secure land rights enable rural communities to adapt to a changing climate and better manage their resources. Faith in the future is critical for farming families to invest time and money into practices to build healthy soils, to help grow their farms and feed their families. It is also important for preserving forest-based food systems. Land rights are critical to preserve the local plant species needed to create nutritious and plentiful food systems. Today, 50 percent of our diet is based on three crops: wheat, maize and rice. An intimate connection to land has been important for communities to cultivate and care for local seeds and plants over thousands of years. Today many species are neglected and under-researched, and risk being lost forever. Land rights for women secures food for their family. Women’s ownership and control over land increases food production which positively affects household food consumption. Women leaders are often at the forefront of defending Indigenous and community land rights. The food of hundreds of millions of people is at risk, and those who defend their rights often face threats of violence, even death. We call on governments to act now by taking concrete steps to secure the land rights of Indigenous Peoples and local communities. Legally recognize, protect and enforce the land rights of Indigenous Peoples and local communities. Create a safe space for people to speak out for their land rights and stop the violence towards land rights defenders. Develop accountability mechanisms to ensure that companies do not violate rights in their overseas activities and that food imports are land-grab free. Ensure gender justice in land governance and women’s equal participation in decision-making. Invest in local food systems: support family farming and value local food cultures which are a vital source of knowledge and heritage. To learn more about how this issue impacts everyone from rural farmers in Guatemala to Yuin fisherfolk in Australia, read the full Land Rights Now policy brief: here.